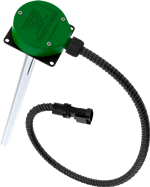 Liquid level sensors Omnicomm LLS are high-frequency liquid level sensors intended for measuring liquid level in a vessel or a fuel tank of a vehicle. Sensors Omnicomm LLS are connected to the register of monitoring system and send it measured level data. All the liquid sensors Omnicomm LLS are famous for their high accuracy and stability of data, wide operating temperature range from -60 up to +85 degrees, as well as high maximum power supply voltage and reliable protection of electric circuit from interferences and connection errors. Relative observational error of level measurement throughout the whole temperature range does not exceed 1%. There is a lifetime guarantee on all the liquid level sensors of Omnicomm LLS. 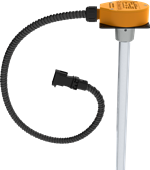 Liquid level sensor LLS is a high-frequency liquid level sensor intended for measuring liquid level in a vessel or a fuel tank of a vehicle. Sensors have extended rating of feed voltage and extended range of operating temperatures. Readings of LLS do not depend on voltage of onboard network of a vehicle. During manufacturing there were technologies applied, which ensure high reliability and tamper-proof of equipment. Omnicomm LLS 20160 has digital interfaces RS-232 and RS-485. Use of digital interfaces provides high interference protection and accuracy of data transfer, as well as maximum resolution of measuring. Besides that, sensors also have high level of protection of supply circuits including usage of enhanced galvanic isolation. Omnicomm LLS-AF 20310 has output with sending reading by analog or frequency signal. Sensor is flexible with settings of range and features of output signals, and output signal level is not dependant on power voltage. All this makes it possible to connect LLS-AF 20310 to any register that has measuring input by voltage or frequency. Omnicomm LLS 20230 has explosion proof design and it is used for installation on objects with higher safety requirements: fuel tankers, fueling trucks, fixed fuel storage tanks. For measurement transmission liquid level sensor uses digital interfaces RS-232 or RS-485, and it has similar LLS 20160 features of interference protection and accuracy. Explosion- protection of the sensor is applied only together with spark protection enclosure20240! All the liquid level sensors Omnicomm LLS are tank type level indicators. Compared with regular resistive fuel sensors, tank type sensors are completely different with electronic way of operation and there is no moving part that guarantees high accuracy, stability and reliability in operation. A opposed to flow-type level sensors tank type level sensors are not tie-in fuel line and they don't impact engine's operation, and they can detect time and volume of filling and draining, which is impossible by fuel flowmeters. For accurate identification of liquid level there is fluctuations filtering algorithm Fuelmetrix used, developed by Omnicomm Company, which guarantees receiving of accurate data even in extreme conditions of operation.